Sitting on the roof of Selfridges, sipping a glass of Chateau Léoube rosé, surrounded by boxes of vegetables and herbs, I felt as though I had somehow slipped down the rabbit hole into wonderland when I got into the express lift to the roof of Selfridges. Emerging into the sunlight, the roof has been transformed into a terrace café with the 9-hole golf course beyond. 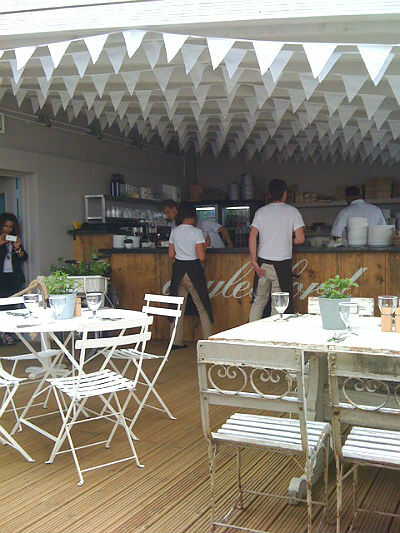 The café has the feel of a market garden restaurant with broad white umbrellas and a retractable roof in case of too much sunshine, or the occasional spot of un-seasonal rain. 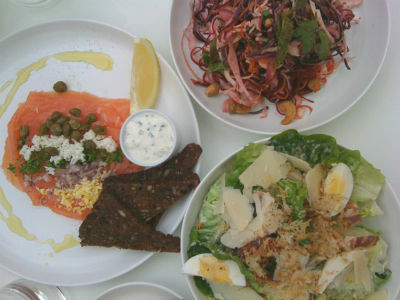 We nibbled on delicious salads, the best of the Daylesford classic menu, and sipped their latest vintage of the Bamford family owned house rosé, Chateau Léoube. The jelly for pudding topped it all off and as I strolled around the London landmark, cake-inspired golf course I once again sensed Lewis Carroll at my elbow. Was it all a dream?